Miyuki® Delica beads (size 11/o) are cylindrical in shape and have very thin walls and large holes for their size. Because of their uniformity, they are perfect for loomwork, peyote stitch and brick stitch; giving the appearance of little tiles when finished. 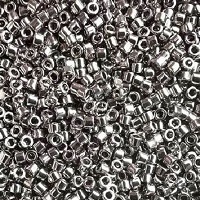 Loose beads are packaged by weight in grams ("gm"). There are approximately 200 beads in 1 gram. For a quick overview of all our 11/o Delica colors, please refer to our COLOR CHART or narrow your search with the links provided below.